See the linked pages below for excellent video examples of these moves. The inside hand lay-up can be used when you sense that a shot-blocking chasing defender is trying to block your lay-up. Use the inside hand (left hand on the right side, and right hand on the left side), and lay it in under the defender's arm. When approaching the basket, instead of planting the inside foot (left foot for right-handed lay-up), you plant the outside right foot while extending the inside left hand forward to lay the ball off the glass. Imagine you are approaching the hoop at full speed and there is a defender already there waiting for you. Use the pro hop. 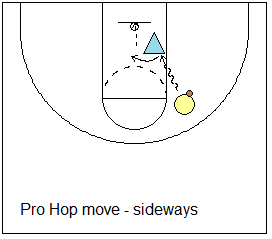 Dribble at the defender, then suddenly stop and hop sideways (if the defender stays back) into the paint for the pull-up jumper. If the defender initially moves out toward you, then instead of hopping sideways, hop straight past him/her toward the hoop for either a short jumper, or a lay-up. Very importantly, when making the hop swing the ball high across your face so the defender cannot slap it away. The floater is used when you dribble-drive around your defender, but there is a big, tall defender waiting inside to either block your shot or take a charge. Use the floater to launch the ball high over the defender's outstretched arms and hands. Stop short of the big defender, under control, and avoid the charge.